Resolution of the Board of Deputies of the city Belgorod №80 from the 25 of March 2014 "On approval of the design and use, including on a paid basis, parking (parking lots), located on the public roads of local significance of the city district "City Belgorod" (link). Resolution of the Board of Deputies of the city Belgorod №81 from 25 of March 2014 «On approval of the procedure and the maximum amount of fees for use of a paid-based parking (parking lots), located on the public roads of local significance of the city district "City of Belgorod" (link). Resolution on the draft law of the Belgorod region "On Amendments to the Law of the Belgorod region "On administrative offenses in the Belgorod region" (adopted on first reading by the Resolution of the Belgorod Regional Duma number P / 36-16-5 of 29 May 2014)" (link). 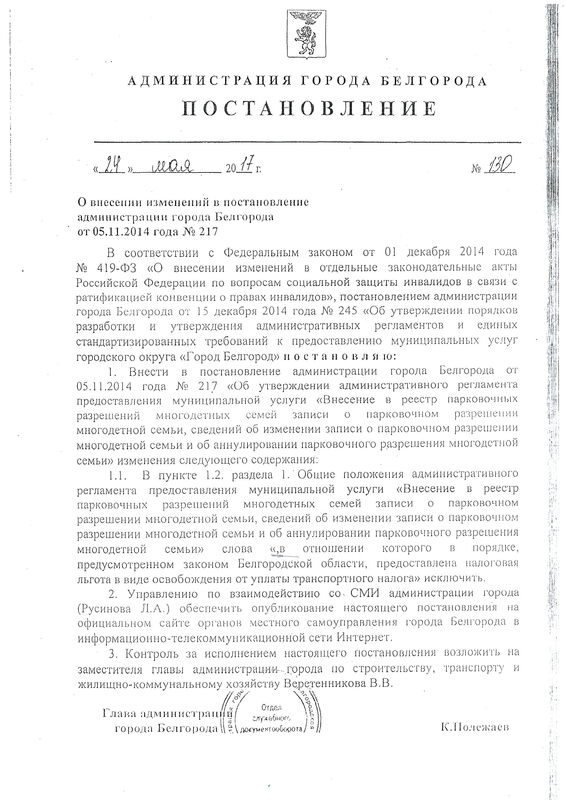 Resolution of Belgorod city administration №202 from October 10, 2014 "On the organization of paid parking" (link). Resolution №181 from December 21, 2015 on Amendments to the Decree of Belgorod city administration on October 10, 2014 №202 "On the organization of paid parking" (link). Resolution №215 from November 5, 2014 on the approval of the administrative regulation of municipal service "Adding to the registry of parking permits for disabled records of a parking permit for disabled, the extension of the disabled parking permit and revocation of the parking permit for disabled" and Amending Resolution of the city administration on October 10, 2014 №202 (link). Resolution №216 from November 5, 2014 on the approval of the administrative regulation of municipal service "Adding to the registry of parking permits a record of parking permits for war veterans, former underage prisoners the concentration camps, ghettos and other places of detention, created by the Nazis and their allies during the Second World War" (link). Resolution №217 from November 5, 2014 on the approval of the administrative regulation of municipal service "Adding to the registry of parking permits for large families a record of a parking permits for large family, information on changes in the recording of a parking permits for large family and revocation of the parking permits for large family" (link). Resolution №224 from November 7, 2014 on the approval of the administrative regulation of municipal service "Adding to the registry of parking permits for a resident records of the resident parking permits and the cancellation of a resident parking permits" and Amending Resolution of the city administration on October 10, 2014 №202 (link). Resolution №16 from January 24, 2017 on Amendments to the Decree of Belgorod city administration on October 10, 2014 №202 (link). Resolution №19 from January 24, 2017 on Amendments to the Decree of Belgorod city administration on November 05, 2014 №217 (link). Resolution №130 from May 24, 2017 on Amendments to the Decree of Belgorod city administration on November 05, 2014 №217 (link).